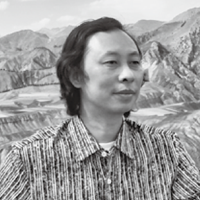 Born in Guizhou in 1965, Yao Hui began writing poetry in the eighties. Praised for the precision of their language and the concrete specificity of their imagery, his poetry collections include Dreams of Two Types of Men, Time in the Flame, and Before Spring. Yao Hui has also published fiction and essay collections, and serves as a cultural ambassador for the Maotai Distillery Group.